This article addresses the fiduciary duties of corporate officers. Responding to a critique that recent scholarly analyses of officers depart from reality, it argues that, on a variety of grounds, those analyses are more realistic than the critique and provide doctrinal coherence and advance the goal of meaningful executive accountability. The divergent governance functions of directing versus managing are described and it is argued that those disparate roles should matter for fiduciary duty analysis. No great outbreak of litigation should be expected if officers are held to a stricter duty of care than directors because boards of directors, not courts, likely will resolve the vast majority of disputes concerning officer breaches of duty. The ex-ante and ex post roles of fiduciary duties are emphasized, and the need for the Delaware legal community to more fully address officer duties is emphasized, lest the federal government emerge as the chief regulator of senior management, a role central to corporate governance. Lyman P.Q. 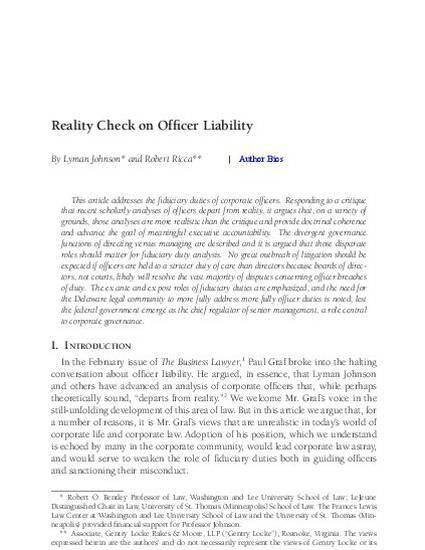 Johnson, Reality Check on Officer Liability, 67 Bus. Law. 75 (2011).